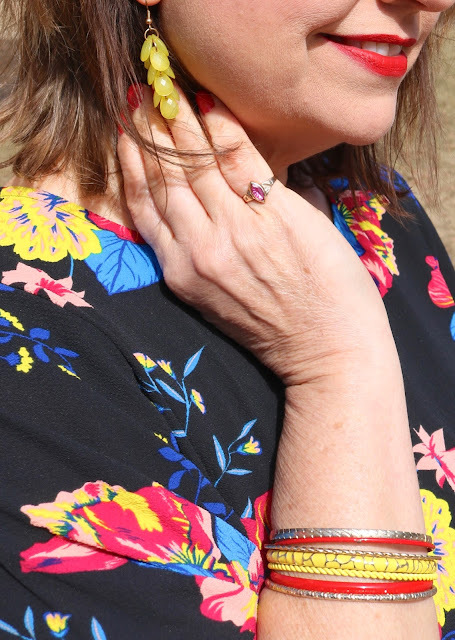 I'm so happy to co-hosting today with Jeannie from A Pocketful of Polka Dots and the other ladies of the Ageless Style Link-Up. Jeannie picked the theme of "Yellow" this month. I was thrilled with her theme and said "I have a few yellow items in my closet, but I'll keep my eye out for something new when I'm shopping". I ended up coming home with a pretty light yellow blouse from Maurices. I liked it when I tried the top on in the store, but when I saw the pictures after my photo session, I didn't think the light yellow looked good with my skin tone. So back to the store I went, and I found this top on clearance at TJMaxx for only $10.00. After seeing these pictures I learned a valuable lesson: shades of color matter. I look better in bright, warm, or hot colors! At least now anyways. That could all change in the summer when I have more of a tan. It was so cold the day we took these pictures. Who am I kidding, it's been cold every day that's why I've been mostly photographing indoors. I wore my CJBanks black, faux leather jacket and a bright pink scarf for extra warmth. I carried a yellow bag for more color and to carry on with the yellow theme. This is spring dressing in Wisconsin folks! Wear bright colors so you can at least dress like spring, but still stay warm with plenty of layers, outerwear and scarves! The black floral top is sheer; I wore a tank underneath. It also has large, flowing bell-type sleeves. I highlighted the yellow flowers in my top with yellow earrings and bracelets, and I carried a bright yellow bag. I think it will be fun pulling other colors out of this top too like the bright blue and red. Wouldn't a bright red bag look great? Or how about a pair of bright blue shoes? I think I'll be able to create a lot of fun, different outfits with this top. For footwear I went with black booties (old, Famous Footwear) as it's still too cold for sandals or flats. These bright yellow, long earrings were the perfect accent jewelry with this top. I wore a variety of red, gold, and yellow bracelets on my wrist. I finished the look off with bright red lipstick and nail polish. My cute little yellow handbag was a gift from my daughter (old, Charming Charlies). I wore this outfit to church on Sunday and then out to lunch with friends. My high-waist released frayed hem skinny jeans are from Charlotte Russe. The floral top looks gorgeous on you Amy. Love all the colours involved here, it's lovely. Love this fun outfit, Amy! Making jeans look cute and put together is my favorite kind of outfit. Now the is pure Spring Amy!!! I love it and your pops of Sunshine yellow!! Cute outfit! Loving the floral top! Spring has been taking its sweet time getting to KC, too- we're back in the 30s today, oy. Love your yellow bag- such a bright + sunshine-y piece! Oh, isn't this just awful? I hope this ends for everyone soon. Thanks so much! I absolutely love all of the yellow details, Amy!! Thanks for co-hosting with us!!! Thanks Jodie. And thanks for letting me co-host! Cute Amy! I love the pop of yellow wiht your bag, as it accenturates you pretty floral top! Amy, I can't believe you got that top for $10. Score! Love the way you brought out the yellow and that you could actually do that with so many colors in this cute top. Thanks for joining our link up! I know! Score! I love finding deals. Thanks so much! I have some yellow accessories and I just got a yellow top I can't wait to wear. I am loving all this yellow inspo! Your bag is so fun! Thanks Laura. I do love yellow. It's so bright and cheerful especially during these dreary months. I love how you incorporated yellow into your outfit! So many yellow details that I was loving all the pops of color. Your blouse is such a bargain and a great find. I do agree you can have a lot of fun with it. Thanks Maureen! I'm looking forward to pulling out some of the other colors. Thanks Ada! I saw your yellow outfits in the link up and thought they looked super cute. So happy to have you as a cohost this month! That bag is just too cute. It’s absolutely perfect paired with your top. And, yep, I agree, you can totally have fun pulling out different colors from that top. That top is absolutely gorgeous! I do love the bright colors on you and of course pairing it with that yellow purse is adorable! I just think it’s the cutest thing that Jackson has a lovey! What a sweet kitty! I feel like venturing to ikea is an adventure too. I also live in the country a good two hours from one! It is so cute. My heart just melts every time I see him carrying around a teddy bear. You really can't go wrong with florals on spring, and looks lovely with the leather jacket! Thanks Jess! Florals keep getting hotter and hotter! Thanks so much for joining us this month as co-host, Amy! I really like your pretty floral top and how you incorporated bits of yellow throughout your look. Definitely a way many women would choose to style yellow. I hope it warms up for you soon! My New Guest Room Remodel: The Big Reveal!